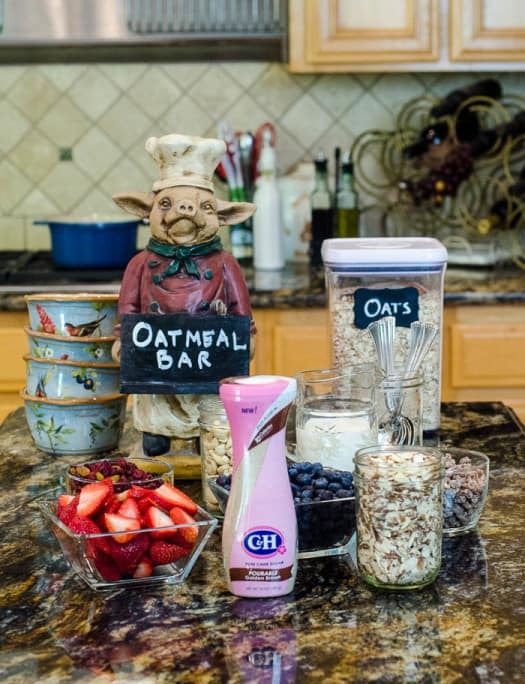 Serve Yourself Oatmeal Bar and a $100 VISA Gift Card Giveaway! 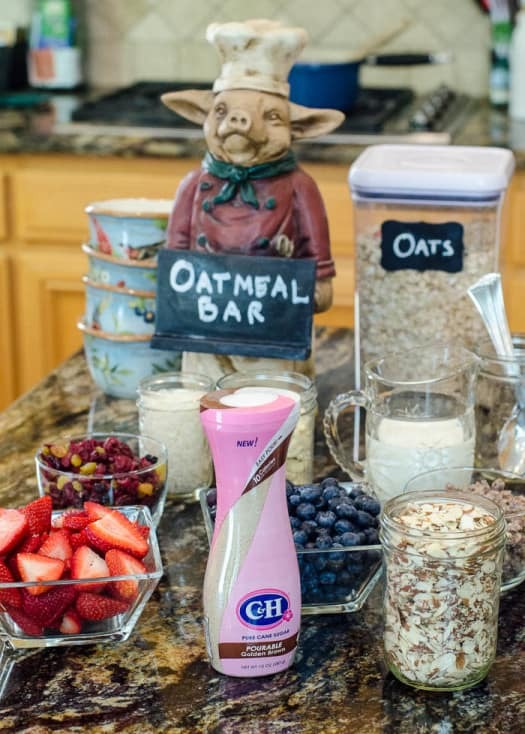 A serve yourself oatmeal bar is a fantastic way to easily take care of feeding a group of overnight guests or even just your family on a lazy Sunday morning. If you’ve got guests coming here’s an idea to help simplify your life when you’ve got a houseful of folks with breakfast expectations. 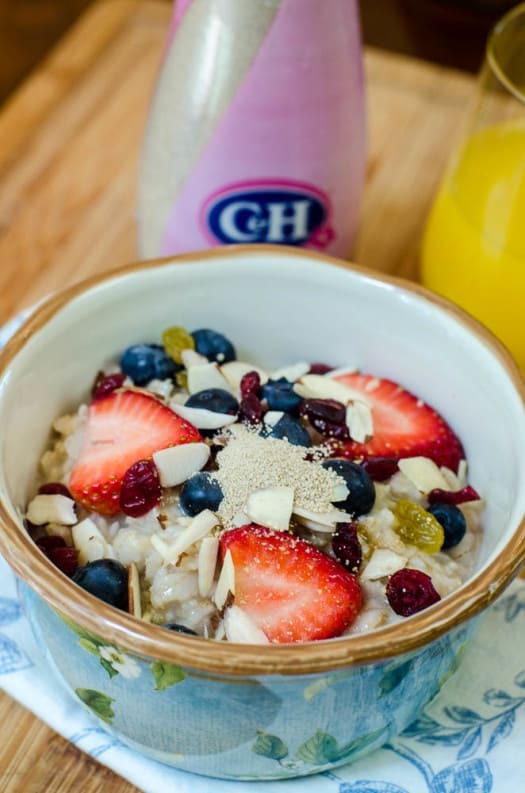 Create a buffet full of fresh and delicious toppings and let everyone build their own custom bowl of oatmeal. It’s a snap to pull together and you can prepare everything except the oatmeal the night before. 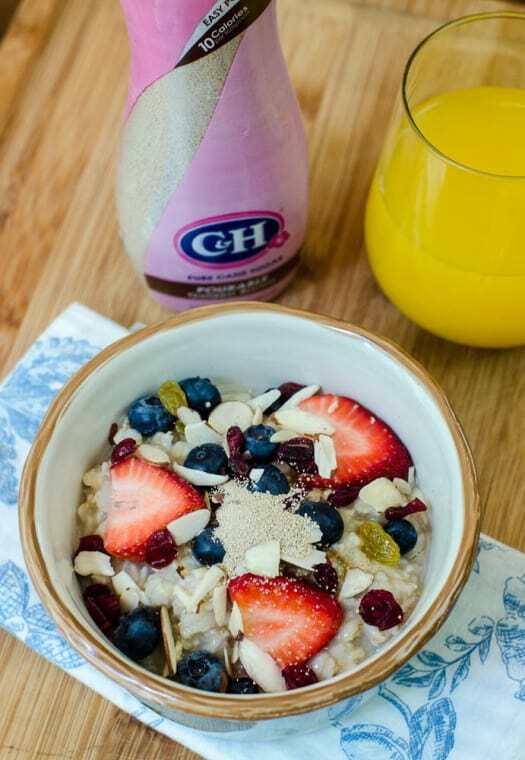 When you wake up the next morning you’ll be minutes away from a beautiful and totally wholesome breakfast buffet. I would do this any old time but especially on a day when we’ll be stuffing ourselves full of ham and scalloped potatoes. A healthy breakfast is probably a wise choice. Let’s talk a little bit about how to pull this together and then….let’s talk about the giveaway! I can’t imagine oatmeal without brown sugar. It’s a requirement for me. I also love to heap it with all kinds of other delicious toppings. What I decide to put out varies each and every time. I always include whatever dried fruits and nuts that I have stocked in my pantry and will also pick up some fresh berries to add to the mix. 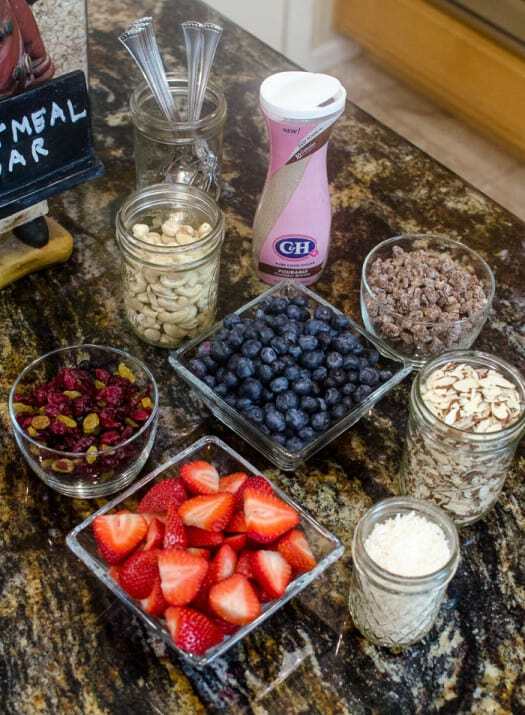 My toppings of choice this time around clockwise from the top – C&H® Pourable Golden Brown Sugar, chopped dates, raw sliced almonds, sweetened flaked coconut, fresh strawberries, dried berry/raisin blend, raw cashews, and fresh blueberries. We haven’t even technically hit spring yet but we are getting some gorgeous fresh berries here in Northern California. This snazzy flip-top dispenser of C&H Pourable Brown Sugar makes measuring for recipes neat and easy. The free-flowing granulated brown sugar measures cup for cup with regular brown sugar and there’s no need to “pack it” when measuring for your baked goods. So cool. 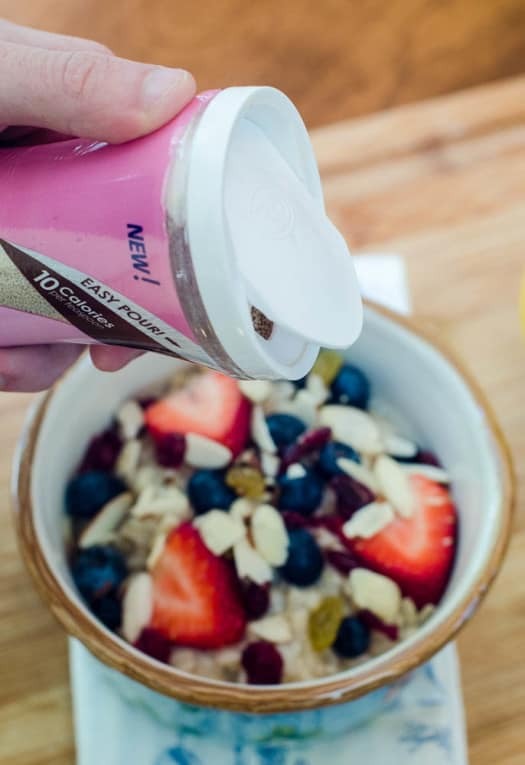 It’s super convenient for sprinkling over fruit, yogurt, and to sweeten oatmeal and cereals. 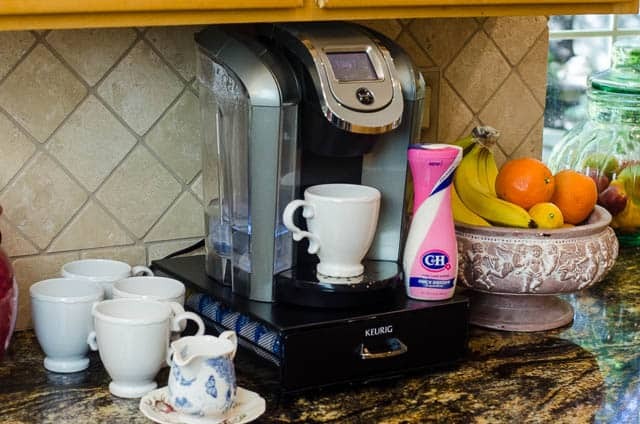 Quick Dissolve Superfine Sugar is also available in the same handy container that is sleek enough to leave out next to your coffee station. 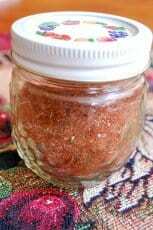 It’s just the thing for your hot beverages and the super fine crystals dissolve beautifully into your cold drinks like iced tea and lemonade. 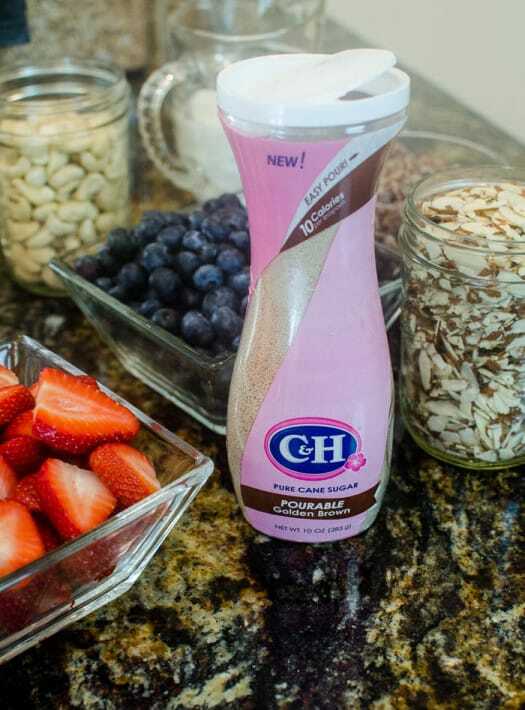 Look for flip-top sugar canisters from C&H® Sugar, or its sister-brand Domino® Sugar (available in the eastern half of the US), next time you’re at the grocery store. For a coupon, visit chsugar.com or dominosugar.com. What’s your favorite way to use brown sugar? Tell me in the comments section below for a chance to win a $100 VISA gift card! Each comment will automatically be entered to win. Best of luck to you all! Be sure to visit Domino and C&H Sugar’s brand page on BlogHer.com where you can read other bloggers’ posts! oatmeal and other hot cereals! I like to put brown sugar on my malt-o-meal. I love brown sugar and butter on yams! I would say brown sugar in peanut blossoms – because it mixes well with peanut butter and I don’t eat them. I like to use it in my chocolate chip cookies! I like using brown sugar in my oatmeal but love making cookies with it too. I love to use brown sugar to make cookies! I love it in cookies! Brown sugar always reminds me of pineapple upside down cake. Yum! I love a brown sugar crumble topping on apple crisp! I use brown sugar in my ham glaze and as a sweetener in a recipe I make called carrot cake steel cut oatmeal. My favorite way to use brown sugar is in chocolate chip cookies! I like it most on my baked sweet potatoes! I love using brown sugar in my home made chocolate chip cookies. i would use the brown sugar in chocolate chip cookies. I love to use brown sugar on my cinnamon toast! My favorite way to use brown sugar is in chocolate chip cookies made from scratch! I like to use brown sugar as one ingredient in my pork ribs rub. I use brown sugar in my chocolate chip cookies. I love using brown sugar instead of white in chocolate recipes. So much better! Love to use brown sugar in baking! I love using it in blondies.. and sometimes I sprinkle it in my coffee. I use brown sugar all the time – on oatmeal, for sweet and sour sauces, in cookies. Love it! I love it on yams! Brown sugar in my baked beans! 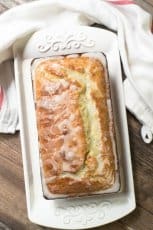 I use brown sugar to make a almond flavor pound cake, it is a family favorite. I love brown sugar on top of my oatmeal. I love to use brown sugar in chocolate chip cookies! 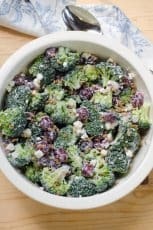 i use it as a muffin topper mixed with butter and oatmeal with walnuts! I love to use brown sugar when making homemade butterscotch pudding. Yum! There is almost no way to extol all of the great virtues about brown sugar, but to be honest my fav way to use it is in cookies. It makes cookies so amazing! I put brown sugar in my hot tea and coffee~Yumm! My favorite way to use brown sugar is in a family recipe for chewy brown sugar cookies. I love to use brown sugar in my oatmeal cookies! I put it in my oatmeal. My favorite way is to make overnight maple & brown sugar oatmeal. I love to add brown sugar with a little cinnamon to oatmeal. Is there really a bad way to use brown sugar? Of course it’s great in baked goods…but I love it in sauces on proteins as well. Love it in sautéed apples — goes well with pork for dinner! My absolute favorite way to use brown sugar is definitely in chocolate chip cookies. Loadsss of it! I like to use it in the sauce for bourbon chicken. I love brown sugar in my morning oatmeal! Delish! I usually use brown sugars in my cookie recipes. Love it on oatmeal too! I love brown sugar in Cream of Wheat! I like to use brown sugar in any pumpkin recipe. I love using brown sugar in my homemade chocolate chip cookies. The thing that makes my strawberry shortcakes so good is that I don’t top them with whipped cream; instead, I mix brown sugar with sour cream and dollop that on top. 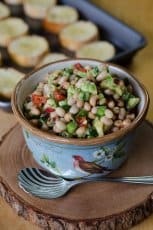 It add a nice depth of flavor that I just love. I like to sprinkle brown sugar on bacon before baking it! YUM! I like to use brown sugar with strawberries and sour cream. I also use it on hams and pineapple upside down cake. I *love* brown sugar on oatmeal! I also love brown sugar glazed cooked carrots. I use brown sugar on baked sweet potatoes. I like to use brown sugar making Asian sauces – esp for General Tso’s Chicken! It is really good to use in hot apple cider. Really gives it a good flavor mixed with the spices. Oatmeal is my favorite way to use brown sugar too! I love putting brown sugar in my sugar cookies!